These are easy to make and make a wonderful homemade gift or dessert. They are especially wonderful with a cup of tea! They can be infused with any flavour you like, here we choose to infuse with a berry note but simply replace the berry tea bag with mint tea, Earl Grey or infused the boiled water with cinnamon, cardamom & chill - the possibilities are endless! Water is normally the enemy of chocolate as it can cause chocolate to bloom and cease but here we create an emulsion with the chocolate and water, leave it to harden, then shape into balls and coat and decorate! 1. For the first step we are going to make the chocolate mousse with chocolate and tea of choice. Pour 150 ml of boiling water over your tea bag to infuse for 2-3mins. 2. Chop 250g of chocolate into small pieces and place in medium bowl (needs to be a metal bowl), pour your infused hot water (tea bag removed) over the chocolate. Stir with a fork or whisk until all the pieces are melted and it resembles the texture and smoothness of a hot chocolate. There should be no lumps. If there are any lumps just put the bowl over a Bain Marie and heat till smooth. 3. Put equal parts of cold water and ice into a slightly larger medium metal or plastic bowl for the ice bath. 4. Place the bowl with the chocolate over the ice bath so the bottom of the bowl with the chocolate is touching the ice-cold water and whisk. Continue to whisk until the mixture has the consistency of thick whipped cream, it should take about 3-5 mins. Put in the fridge or freezer for 30 mins. 5. Time to prepare your decorations while the mousse sets. Set them aside in separate small bowls for decorating. 6. Melt the 150g of chocolate for coating over a Bain Marie or in the microwave. 7. Line a large baking tray or board with baking parchment. 8. Remove the chocolate mousse from the fridge or freezer. Your chocolate should be quite hard but also still a scoop able, light mousse texture. 9. Using a teaspoon, or small melon baller, spoon out a small ball of chocolate mousse and roll gentle in your hand into a smooth ball shape. Be careful not to handle too much or for long as the heat in your hands will melt the chocolate and make it harder to handle. 10. 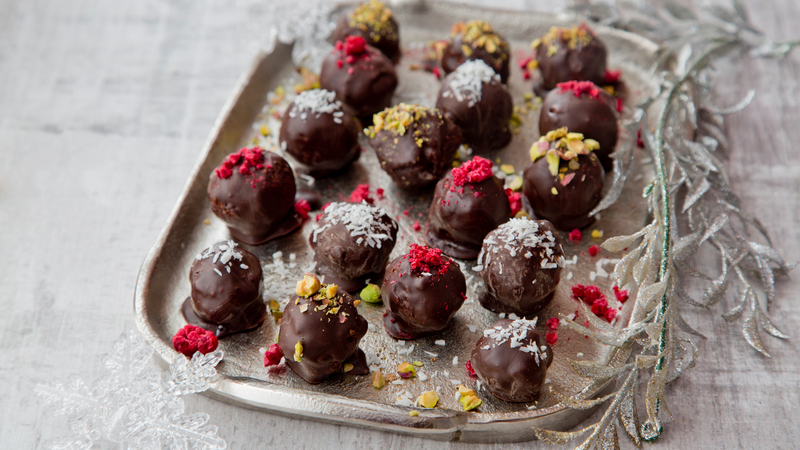 Toss each mousse ball in the melted chocolate, gently one at a time. A good technique we found is to use 2 dessert spoons, one for tossing in the chocolate and keep one clean to transfer to your clean parchment. Decorate your truffles 4 at a time while the chocolate is still slightly melted. Repeat till all the mousse and chocolate is used up. 11. Leave to set in the fridge and enjoy!